thats lovely...what u won is friendship n thats most imp. These are the best way to share ideas with eachother. Btw, people, Neha keeps saying she never wins any round.. blah blah.. but she is the sort of binding factor in our team. 1. Neha: The glue that binds us all together :-) Chatterbox, Enthusiast, Blogger, Friend.. all rolled into one :-) Without you, I would have never come this far!! MY FAV POST OF YOURS: ULTIMATE PAINTING. MY FAV. POST OF YOURS: 55-FICTION ON DRUG ADDICTION. MY FAV. POST OF YOURS: 55-ER ON LOVE. 4. Kanagu: The only guy to courageously take on any post that comes his way, esp. those boring posts that most of us run miles from. He's sincere and enthusiastic, and I'm so happy he is part of our team! MY FAV. POST OF YOURS: EDUCATION AND EQUALITY. MY FAV. POST: PLEASE DON'T KILL ME, I CAN'T DECIDE! 7. Saurabh: The fun-guy, who trashes us every time we say 'feel free to trash my idea' :-) Scared of this hip hop guy! But thrilled he is part of our team! Totally, totally, loved this one Neha. That was pretty much what I would have written if I wanted to write on our journey so far, and I'm sure, so would have all of us Tigers. Personally, I honestly don't care if we win or lose anymore. But knowing how much the team has gone through, and how much the team wants to top again, I want us to win, and win in style. Thanks Jasoos Neha for this. ;) I'll try and pass this link to GC. @Pal - I loved your take on each of us. So very true. But how could we forget you. 8. Pal: Witty, funny and to the point. Pal is always there to read our posts and give her honest comments. She wants each of us to do our best and therefore is always there to tune up our posts if required. We win or we don’t, we have made friends for life in this whole process of BPL. People say that we have known good bloggers thanks to BPL, but I believe most of the people blog or write because they are good at it. You will come across very few bad bloggers. Just great! Made a fantastic reading!Keep it up! 4. Sudhakar designed the Sunday Roar poster and also the team blog for the grand finale; apart from churning out winning posts every time. 9. I always used to crib how taxing BPL is turning out to be, but loved each and every moment of it. My friends, colleagues everybody knew about BPL and enquired periodically about out progress. Now I owe them a treat if we win!!!! @ Pal - Do you know that you made my day? Some day, if we meet, I am surely going to treat you to chocolates (as promised after I won for my Mahabharata post) and also a movie (any one, in case the movie based on my BPL post is not yet made) :-) :-) Each time when I used to be low, you cheered me up :-) Thanks Pal..
Glad you and your team had a great wonderful time together!! Btw, Saurabh also topped his college, and Rashmi got a distinction! @ And the Magazine by Sudhakar was outstanding!! So awesome, that a blogger actually wrote to Saurabh, asking when the next edition was, and if he could contribute!! Hey! It is nice to read so much of andar ki khabar from the enemy camp. our (WL) camp was equally fun. But I loved reading about TT. -Sudhakar: My man! Where do I start now. You are one of my most-hated opponent here. And am sure you know why. God.. I cant even begin to tell you how much I hated those rounds. For those of you who dont know the reason - Sudhakar and I had the same topic for 3 rounds.. and he is 3-0 up on me. Do I need to give any other reason? Every single round (probably except the first one) I was expecting to win... only to be beaten by the king later. But... of course there is a reason why Sudhi won! I think Sudhi is a smart writer... with very good use of images in the post... and very good language. No offense to you Sudh... but great job! -Saurabh: I love you work Saurabh. you have this Desi streak in your content.. which I love. With a simple vocab and excellent expressions, your posts are easy to understand and have good humor. -Kanagu, Rashmi, Arpita: I dont have a take on you. Which means you are probably the efficient and silent ones. But I know you were equally effective in producing the results enjoyed by TT. I have a feeling I missed someone... not sure.. apologise. That is that! And with that, I praise your efforts and congratulate you guys for being the top notch. on ground or or on net team work will be always difficult. wonderful to know what was going on in the minds of players :) and team. Rightly said u win or don't ...TT roars have been loud and clear and n number of cheers to that !!! The first thing after I noticed after TT had barely managed to scrape through in the first round (and I know how hard it was for your team, that too in the very beginning...) was the name of your group. 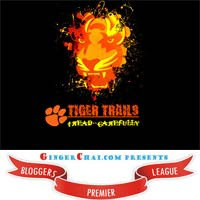 "Tiger 'Trails'", not the noun but the verb and I knew you will win the BPL. And so you should, not offence to anyone else, but if not by anything lese but sheer fierceness, TT will win the BPL. We, incribe Tribes, had two rounds together and I have known terrific friends, I believe the scenario would be the same if we had survived farther too! I was not a part of BPL but have read each and every post of yours, Kanagu's and few other posts. I think you guys should win. Next time i wanna participate :P.
Hey Neha.. yours was one team that I always feared from the beginning, apart from G's. Because you have a great team and have been churning out good posts ever since BPL started. I hope you guys win the finals!! :) Good luck for the finals!!! Awesome journey that must've been. Wow, that's a lot of work. I am really impressed. And to make so man people agree is a feat itself. 50 mails per day?? Phew!! That's some hard work and team spirit. I hope you guys win! BPL 2.0 will never be the same without the same people in the team, I am sure..